Longe vão os tempos em que andar com transparencias era proibidíssimo! Felizmente! Adoro este género de peças que deixam ver um bocadinho mais do que era suposto e ainda gosto mais de as combinar em looks casuais e descontraídos como este. 90% das vezes, peças mais transparentes como esta 'pedem' gangas, sapatos rasos e acessórios despretenciosos, é a minha fórmula secreta para que o look não fique demasiado arrojado. A malha é da Benetton, mais uma peça a que não resisti nesta nova colecção, já foram espreitar as novidades para este Outono/Inverno? Estão com peças lindas! Beijinhos e obrigada por estarem sempre desse lado! Já somos mais de 15 mil no Instagram! Yupiii!! Gone are the days when walking around with transparencies was a big fashion no-no! Fortunately! I love this kind of pieces that show a little more than it was supposed to and I like to match them in casual looks like this one. 90% of the time see through pieces like this one 'ask' for denim, flat shoes and low key accessories, I think this is my secret formula so that the look doesn't get too bold. The knit is from Benetton, another piece that I couldn't resist in this new collection, have you already seen the news for this Autumn/winter? They have the most beautiful pieces! Lots of kisses and thank you for always being on that side! We are already over 15,000 on Instagram! Yeahhh!! It seems you are alone now in the blog, our blog had 3 members and now we are two. It's difficult to be blogger! We love the outfit and nice friend with you here! 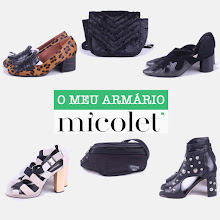 Look lindo �� confortável mas com estilo, gosto muito ☺ Visitem o meu blog se puderem.obrigada! I like your bag, sunglasses, earrings, shoes and cute photos!